The World Cup is an event which sees the best talent from all over the world line up for their countries in a bid to win football’s biggest prize. Each team will have a star player that they will be looking to, in order to try and progress through the group stage and in some cases, expecting that star to take them to World Cup glory. The defending champions Germany are the current favourites to progress beyond the group stage as the winners of Group F in the latest odds on World Cup group stage, at a price of 1/3. The Germans are also the current joint-favourites to win the tournament, at 9/2, along with Brazil. Group A contains the hosts of this year’s tournament, Russia, as well as Saudi Arabia, Uruguay and Egypt. While Russia and Uruguay are the favourites to progress, the likely stars of the tournament will be playing for Uruguay and Egypt. Uruguay have both Edinson Cavani and Luis Suárez, who have been both been instrumental in helping Uruguay to reach the World Cup. Cavani has been in good form for Paris Saint-Germain, having scored 40 goals in 47 games this season, while Suárez has struggled, having only managed to score 31 goals in 50 appearances for La Liga club Barcelona. Given that two seasons ago, Suárez scored 59 goals in 53 appearances, his goal/game ratio, first to 37 goals in last season and now to 31 goals, is a worrying sign for Uruguay, although he will still prove to be an important player for the team and should produce a moment of magic, or if not, a moment of controversy. Egypt meanwhile have Liverpool’s Mohamed Salah, who has had an extraordinary season with the Premier League club. He has managed to score 44 goals in 51 games and has broken the record for the most goals in a Premier League season, scoring 32 times in the 36 matches he took part in. Egypt will be pinning their hopes of progression on him, although fatigue may hit him hard, with the Champions League final yet to play later this month. Group B will see Euro 2016 winners Portugal take on Spain, Iran and Morocco, with their star man Cristiano Ronaldo hoping to add the World Cup to his trophy haul. Ronaldo could make history by winning a third Champions League title in a row with Real Madrid later this month and will be hoping he can continue his incredible form and help Portugal lift the World Cup trophy for the first time. Neighbours and rivals Spain will have Marco Asensio to look to, as the young midfielder looks to make an impact on the world stage, much like he has in Spain. He has become increasingly more integral to the Real Madrid squad and, with the opportunity to star at the World Cup, expect Asensio to put on some incredible performances for the La Roja. France are the favourites to progress from Group C and the team contains some fantastic talent which will be on display. France’s key player will be Atlético Madrid‘s Antoine Griezmann, who has been linked with a move to fellow La Liga side Barcelona. The forward managed to score 29 goals in 48 games this season and will be integral to any success France have at this year’s tournament. Chelsea’s centre midfielder N’Golo Kanté will also be a key member of the squad and will be charged with cutting out the opposition’s attacks and protecting the defence with his impressive defensive abilities. Argentina are the clear favourites for finishing top of Group D, with Croatia, Iceland and Nigeria unlikely to provide too much in the way of competition for the 1986 winners. The majority of the Argentina attackers could be mentioned as potential star players, however, Lionel Messi is the most obvious star of the Argentina squad. Having won five Ballon d’Ors throughout his career, the same number as Cristiano Ronaldo, it is no surprise he is the most likely star from Argentina. Sergio Agüero, Gonzalo Higuaín, Paulo Dybala and Mauro Icardi are also potential stars for the World Cup. Brazil, who are the most successful nation regarding to the number of World Cup titles, have Neymar and Gabriel Jesus in their squad for the tournament this year. Neymar’s injury at the last tournament, which Brazil hosted, damaged the morale of the team and he will be desperate to take the team all the way this year. Manchester City striker Gabriel Jesus’ arrival on the scene will no doubt help to take the pressure off Neymar and he is definitely one to watch this tournament. The defending champions Germany were drawn in Group F with Sweden, Mexico and South Korea and will be looking at young stars Leroy Sané and Timo Werner to successfully defend their World Cup title. Sané has enjoyed a great season at Manchester City, winning the Premier League while contributing 10 goals and 15 assists in the league. Timo Werner, RB Leipzig’s striker, is starting to show that he is a quality player, having scored seven goals in ten games for Germany in 2017, while he has managed to score 21 goals in each of the past two seasons for his club. Sané and Werner could prove to be a formidable combination throughout the tournament and with Thomas Müller, who has scored 10 goals in two World Cups, all three are worth watching. England and Belgium are the two big names to have been drawn in Group G and with players like Kevin de Bruyne and Eden Hazard, it is no surprise that Belgium are the favourites to top the group. Chelsea’s Eden Hazard, who will be captaining Belgium this summer has maintained his good form, despite Antonio Conte struggling to get Chelsea to play as well as they did last season when they won the Premier League. 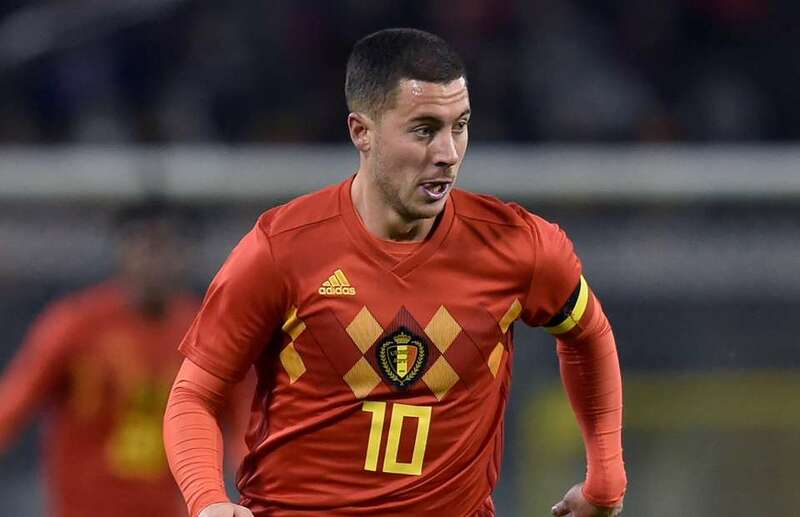 With 16 goals for Chelsea this season, Hazard is going to be a key member of the Belgium squad and will be hoping that the team will finally live up to its potential. Kevin De Bruyne has been one of the standout players in Manchester City’s title-winning team this season, having contributed eight goals and 16 assists in the league. The source of Man City’s attacking play, if he can replicate his form for Belgium, then there will be plenty of opportunities for the likes of Hazard and Lukaku to score goals. With the talent in the squad, Belgium are certainly the dark horses in the predictions on the World Cup winners. Their Group G opponents England will be hanging much of their hopes on Harry Kane remaining as consistent in his goal scoring for England as he has been at club level. With 41 goals in 48 appearances for Tottenham this season, England finally have a prolific goal scorer not seen since the likes of Michael Owen and Alan Shearer back in the 1990s. Colombia will be taking the top scorer from the 2014 World Cup, James Rodríguez with them as they look to progress from Group H, in which they were drawn against Poland, Senegal and Japan. The draw gives them a good chance of progression, especially considering they won all three group games in 2014 against Greece, Ivory Coast and Japan. Following the World Cup, Rodríguez moved to Real Madrid, but found himself increasingly frustrated with the lack of playing time. He has since moved to Bayern Munich and seems to be finding his form once again, perfect timing for the Colombians. With the group draw as it is, Poland’s Robert Lewandowski, who happens to be James Rodríguez’s Bayern teammate will hope to have his shooting boots on for Poland this summer. The favourable group draw gives Poland the chance to progress to the second round and also gives Lewandowski the chance to stake his claim to the Golden Boot.